Letters to my sons. - Trying to explain the world to two very small children. The changing face of music. Many years ago when I was a boy there were three ways to listen to music: on the radio, playing records, playing a cassette. Uncle Phil and I both had a record player each by the time I was 9 or 10. Uncle Phil got Grandpa John’s old record player and I got given one by a person at church. The first record I ever bought was Funky Town by Lips Inc and I paid the princely sum of 99 pence for a piece of 7 inch vinyl. In today’s money (2013) that would be £3.60. I only got 50p a week pocket money in those days so I could only buy a single every two weeks if I didn’t spend more than a penny on sweets or crisps. The record players that we had would allow you to stack the records up and when one finished another would drop down and then play. As children we found this cutting edge technology to be amazing although it was a good 20 years old even then. I was able to maximise my music purchasing power in two ways. The first was to buy second hand records at church and school fairs. Old records and singles could be bought for as little as a penny although what was on offer was what other people didn’t want i.e. rubbish mainly. The other way to get quality stuff was to wait until the record fell out of the charts and pick it up for 49p. This happened to some songs quicker than others but because almost everywhere sold records: WH Smiths, Boots, Woolworths – at least one of them would have over ordered and want to clear the stock. Except at church and school fairs, albums were out of my price range and to be honest not really my thing. As I kid I just wanted the songs they played on the radio not the more self indulgent album tracks. Compilation albums did exist – the top songs of the last few months – but they weren’t by the original artists but done by supposed sound-a-likes although they sounded like they had be recorded in one day and in a single take. The albums were called Top Of The Pops and had the same name as the main music program on BBC1 at the time although the two were not related – although for a few yeas I believed they were. These albums would usually have a scantily clad woman on the front and I remember nearly buying one in a supermarket called Hillards. Then in either 1981 or 82 things changed and a company brought put an album with all the original popular songs of the day out and with album one you got album two free. No more naff sound-a-likes that didn’t sound anything like the original. Then in 1983 came Now That’s What I Call Music and the series went on to dominate the market, killing off Top Of The Pops. So many things from that era no longer exist: Hillards, Woolworths, major shops selling music and the easy availability of vinyl. Music is downloaded now for the same price as a single back in 1980 – 99p. Although downloading is not the same as buying for many reasons. Only being given a stingy amount of pocket money meant my music purchases had to be something that I liked, something that I knew. The only time I could take a risk on something that I might not like was at church and school fairs where I could pay a few pence and if I didn’t like it, simply donate it to the next one. With digital music it is easy to find new artists and songs if you can be bothered to search YouTube or if you have a friend to tip you off. But what is missing is the physical product. I remember when I decided that I was going to buy my first single. I turned on my little radio, tuned to Radio 1, and decided to buy the first record that was playing. I thought about what I would do if I didn’t like the song – let’s hear the song first and then decide what to do. And it was Funky Town. I like the song so I walked in to town, on my own, and visited the different record shops to see which sleeve the vinyl came in. In one shop the single may be in a plain sleeve while in another it would have a full colour sleeve – I learnt that from a lad at school the week before when he was out shopping for singles. The BBC were embroiled in strikes at the time and the TV program Top Of The Pops wasn’t being broadcast so it wasn’t until the advent of YouTube that I got to see the video for the song. The thrill of owning a physical music product is something that you will miss out on. I spent my Xmas money in 1985 on the album “Fugazi” by Marillion. I spent the 45 minute ride back from Newcastle studying the gatefold sleeve: reading the lyrics and admiring Mark Wilkinson’s artwork and seeing how the two matched. You don’t get that with downloads – everything is instant. No journey to the record shop, no journey back, no sleeve notes or album art to appreciate while listening to the music. And I think you’ll be worse off for it. 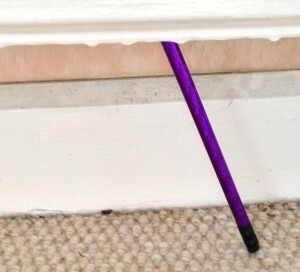 A pencil behind a radiator. I saw this today – a pencil behind a radiator and it triggered a memory. When I was 10 years old I went on a camping holiday with the school to Clipston near Nottingham. The idea of the holiday was to go canoeing and that is what we did in between informal lessons and sleeping in tents. We had to keep a diary while we were there which involved writing half a page of stuff and then drawing a picture. The teachers brought with them packs of coloured pencils for the drawing part. Every evening we decamped to a barn for tea and then do our “homework”. The tables were made from barrels and had a pole through the middle. I got bored and started putting the coloured pencils in the pole in the middle of the tables. When it became time to tidy up the teachers noticed that some of the pencils were missing as the packs were brand new and the teachers were not impressed. The teachers told us that all the pencils had to be returned or there would be consequences. Now I was a little scared, I don’t think anyone had seen me putting the pencils down the pipes but I wasn’t sure. None of the usual kids who liked to grass other kids spoke up so I calmed a little. What if the teachers had seen me – I hadn’t been checking to see if they had been watching, I was just bored and did something to eleviate the bordem. I knew I had to get the pencils back but another wave of fear hit me – what if the pipes were blocked at the bottom? If they where the table would need to be turned upside down to get the pencils back. I walked over to a table which I knew had a pencil in the pipe and lifted it up and to my delight I saw the bottom of a coloured pencil. I tried to pull my best “how did that get there?” face. Other children saw what I had done to unearth a pencil and tried the same with the other tables and before long all the coloured pencils were returned. I haven’t thought about that incident for many years, but a pencil behind a radiator reminded me. The power of advertising – 35 years later. 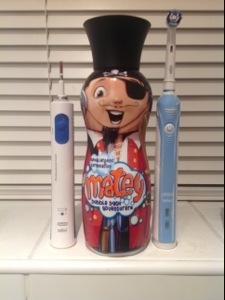 When I was about 5 or 6 years old there was an advert on the telly for a brand of bubble bath called Matey. We didn’t have bubble bath in our house, it was seen as an expensive extravagance but this didn’t stop me and Uncle Phil pestering Grandma Audrey in an attempt to get her to buy some. We didn’t try it on with Grandpa John as we knew we could never convince him. The advert promised that Matey would not only clean the children in the bath but the bath itself, which I thought was the angle I could use to sell the product to my mother. Surely never having to washout out the bath after Uncle Phil and I had been in it would be enough to secure a purchase? No. My mother didn’t believe adverts, pure and simple. In her life time cancer causing cigarettes had been advertised on the TV, even claiming that they were good for you! Our pestering must have had some effect because eventually we did get some bubble bath but I’m sure it wasn’t Matey. I do remember using the shower attachment to swill away the remnants of bubbles. So fast forward about 35 years and I was out shopping and I needed to get bubble bath. And then I saw a bottle of Matey next to Sainsburys own and started to hum the tune from the advert. When I saw that it was on offer at half price and cost less than the usual type I had no excuse not to buy a bottle. So I bought some. It may have taken about 35 years but the advert never left me. I remembered the tune and one of the three selling points. When Uncle Phil and I were younger Grandma Audrey used to buy Penguin biscuit bars. Grandma Audrey told Uncle Phil and I that the blue biscuits were the best. This wasn’t true because all the bars were exactly the same, it was just the wrappers that were different colours. As children we didn’t know this and we took our mothers mischievous joke to be real and argued about who should get the blue one. Usually in a packet of 6 there would only be one blue, the rest would be either green or red. And Grandma Audrey would take the blue one and tell us how nice it was! If one of us managed to get the blue one then we would laud it over the other, telling them how great our Penguin was while the other begrudgingly ate our own, unable to enjoy it because the other one had the blue one. And such is life. I have given up looking at what other people have and wishing that I had it too. Instead I have decided what I want and how I want to live and then do it and enjoy doing it. I decided to wait some months until this story moved away from the public eye to write about the death of Gary Speed. I was looking at the BBC News web site on a Sunday morning when I saw the headline flash up “Gary Speed confirmed dead”. I was shocked because only the day before we had watched him on Football Focus. No other details of his death were given. I told your mother that Gary was dead and she too felt the same feeling of shock. She asked how he died and I said I didn’t know but I thought it must be a car crash as I thought that he must spend a lot of time driving around to see various Welsh players plying their trade. My thought was that he must have been driving home late and crashed. This though was not my first thought. My first thought was that he must have had a heart attack or some undiagnosed heart problem that reared its ugly head and killed him. I suppressed this thought because the man was extremely fit – he had trained regularly for most of his life while I have spent most of my life sitting behind a computer tapping away on a keyboard. If anyone should have a bad heart then it should be me. If someone supremely fit could unexpectedly die with a heart problem – what chance do I have? I switched over to the BBC’s 24 Hour new channel and they were carrying the story but no mention of the cause of death was made, only that police had confirmed Gary’s death. A quick Twitter search and information that Gary had taken his own life started to emerge. I have seen information that is quite clearly fake spread through email, FaceBook and Twitter before so my first thought was “this is rubbish, why are so many idiots regurgitating it”. As I said earlier Gary Speed had been on Football Focus the day before, smiling and happy and joking with his old team mate Gary McAlister. Then the newsreader confirmed that Speed had been found hung at his home and that it was suicide. I felt stunned, a knot developed in my stomach. This could not be true. Why would he do such a thing? Had he been set up by the Sunday tabloid press? There were not mentions of him in that mornings press – so why? The inquest into his death hasn’t started so maybe that will shed some light onto his real state of mind as opposed to the public image. I will always remember Speed for being a Newcastle United player. For our first date I took your mother to a Newcastle game away at West Ham. It was raining very hard that night and we got very wet. At half time we waited under the stand in the dry before making our way to our seats and missed Speed’s goal for Newcastle. Even after the best part of two months I am still stunned and confused by his death. the death was announced today of comedian Chris Sievey, better known for his character Frank Sidebottom. I only saw Frank Sidebottom on video – I did have a chance to see him live when I was student at the Poly of Wales but my mum and dad came down for a few days in Wales. This was in the days before mobile phones and they had no way of getting hold of me so they had come down the day before and we met at Trefforest train station at 11am. I wasn’t sure what time they would want to be getting off so I didn’t get a ticket to see Frank. Grandma Audrey had just had a scan and her cancer was back in remission, which was always nice to hear. By the time my parents and Suzy the dog left it was only early evening. Unfortunately all the tickets had been sold and I had a night in on my own. The lads told me he was really funny. I wrote about the first general election that I remembered and now I want to share some thoughts on 1983’s election. By 1983 the family had moved from Grimsby to the North East and by the time the election came around in June 1983 we still hadn’t got used to the colder weather. Margaret Thatcher won the election by a huge majority for a number of reasons. The main reason was the Falklands War the year before. I remember waking up one morning and hearing on the radio that Argentina had invaded the Falkland Islands as well as South Georgia. We were still living in Grimsby and I my first thought was: Scotland has been invaded. I had no idea where the Falkland Islands were but they certainly sounded Scottish. Also I wasn’t really sure where Argentina was so in my mind it was quite clearly possible for Argentina to invade some Scottish islands – why they would want to do so didn’t enter my mind. My father explained that the Falklands were in the South Atlantic which didn’t help much. He then explained that the Islands were about 8000 miles away. I felt safer at that point as we used to go on holiday to Scotland and stay in cheap and grotty cottages. Argentina were more than welcome to dusty, smelly cottages without TV’s, central heating and had burn water coming out of the taps, that tasted rank by the way. Of course not all Scottish self catering cottages were in such a state, it was all my parents could afford at the time. As an eleven year old child I really wanted a war because war was exciting. Bombs, bullets and airplanes. As the diplomatic efforts sped up many people around us, my parents especially, were hopeful that war wouldn’t come. They had both lived through World War 2 and many of the older people at church had fought either on the home front or the actual front. When an old man asked me what I thought about the Falklands, I told him that I wanted a war. I didn’t understand the look on his face at the time by I know now: pure pain. Before long the boats were off to take back the Falklands including two aircraft carriers, HMS Hermes and Invincible. Military bands played as the boats left port in a “Task Force” and different news readers tried to pronounce “junta” correctly. Even with the Task Force sailing 8000 miles, peace was still a possibility because it would take 6 ot 8 weeks for the Task Force to get into position. We were the last family to get a colour TV in our street but we were the first to get one with TeleText. TeleText was a massive revelation at the time. While watching TV you could press the “Text” button and you would get a “page” of information usually a menu on Page 100. From there you could enter page numbers to get the information you wanted. News was on pages from 102 to 125 and if you went to page 150 you got a news flash. The news flash page allowed you to see almost all of the screen and a few lines of news. If you pressed the Recall button the news flash would disappear and you could carry on watching the TV until the page changed and then it would pop-up again. The problem was you couldn’t change channels because the TeleText was tied to the TV channel you were watching. This wasn’t really a problem for us as we tended to watch BBC1. One night we were watching TV when the News Flash come up on the screen. I read it incorrectly as I though it said that Sheffield had been bombed by the Argentinean’s, in actual fact the ship HMS Sheffield had been hit by an Argentinean missile. My heart fluttered at the thought of a city being attacked, could it be Grimsby next? Our teacher at the time had been a little mischievous in the run to the war telling us that if things got bad and escalated we, his class, could be drafted in to the army to fight. It had happened elsewhere in the world he told us. This information didn’t dampen my desire for war and when I re-read the New Flash and saw that it was a British ship that had been sunk I really was excited. I asked my dad: “Does this mean war?” “Yes it does” he replied with much foreboding. I looked at Uncle Phil and we smiled at each other – nothing like a good war to get an 11 and 13 year old excited. It must be remembered that in 1982 we only three channels on the TV and no rolling news. Before the news every night there was a half an hour program dealing with the days war news. During the conflict the Argentinians claimed that they had sunk Hermes at least three times. They also claimed that they had shot down a considerable number of Sea Harriers. This lead to the famous quote from John Hanrahan: I’m not allowed to say how many planes joined the raid, but I counted them all out and I counted them all back. They used this quote during the opening titles so it was repeated every night and soon learned. I remember watching some war footage with my mother not long after the conflict finished and it showed a Harrier launching an air to air missile that followed an Argentine plane before hitting it and blowing it up. I let a “YES!” at that point but my mother rebuked me: “That was someones son that just died” she told me. I think that was the point that it all started to sink in. War isn’t a game, it isn’t fun – it is about people trying to kill while not being killed themselves. The British eventually won the war and returned home to massive adulation. I remember being at South Parade Middle School on the day victory was announced. The lads who played football in the top and second to top year spent the morning play time singing songs about beating the Argies. I’m sure where the songs came from – someones dad probably went to football matches as there was plenty of swearing. Being only 11 and knowing that “your” country has just won a war, against the odds and thousands of miles away from home filled me with euphoria. Along with other feelings I experienced as a child, I have never experienced anything like it again. My mothers reaction to the death of the Argentinian pilot has stayed with me because it showed a little split of her personality. She was born in 1937, two years before the Second World War kicked off so she got a full dose of the anti-German propaganda that was pumped into the population from 1939 – 1945 to justify the bombing of innocent German civilians – in the same way that the Germans were busy de-huminising their own population in order to justify murder. Some of this propaganda stuck as, from time to time, she would come out with something very anti-German and then laugh it off as rubbish. I remember just before we left Grimsby we were looking at tapes in Woolworth’s and she found one that had lots of songs on it that she liked. She showed to me and said “I was going to buy that, then I saw that it had ‘Don’t Cry For Me Argentina’ on it. I don’t want it now” and she put it back. I went to a ruby match between England and Argentina recently and I was a little perturbed to see Sea Cadets holding an Argentina flag. War propaganda leaves it mark. And so it did with the electorate. Just over a year later Margaret Thatcher was re-elected with a massive majority which she used to pass the most divisive of legislation. She was able to satisfy the needs of the people with money while pushing whole segments of society into poverty – poverty that remains today. Not that I understood all of this at the time. On the day Thatcher won I cut out her picture from the paper and attached to the car window on the way to school. I understood what Thatcher said when she said that the country must compete with other countries and that meant reducing wages. As a 12 year old this made sense and it’s true. Unfortunately there is no way to compete against countries like China that use political prisoners as slave workers although this escaped me at the time as I was caught in the smoke and mirrors that is capitalism – or the version of economics that is called capitalism. But these are my memories of the 1983 election. after my last post things have moved on. Gordon Brown resigned and David Cameron become Prime Minister. The first change of Prime Minister I remember was when Margaret Thatcher came to power in 1979. Mr Robinson, the head teacher at South Parade Middle school, told us in the morning assembly that we now had the first woman Prime Minister in the UK although she wasn’t the first woman Premier in the world as there had been others. I remember the election being called, the front page of the Telegraph had a picture of a calendar showing the date of the election. In those days at home we used to have tea while listening to “P.M.” on Radio 4 and they used to broadcast a lot of the debates in Parliament. I remember something about the Liberal’s not being allowed to use a dispatch box because some MP’s put their feet up and wouldn’t let him past. Parliament wasn’t televised in those days and as a child I had no idea what it looked like inside. I had this idea that all the MP’s were all in a large hall like the church hall at the Haven Methodist Church, were Grandpa John was the Minister. The church hall had a large set of both brown and blue chairs made from tubular steel. When we had boys brigade in the hall we used to get out blue chairs – the colour of the Boys Brigade uniform and not brown – the colour of the Brownies uniform. In my minds eye the rows of chairs were put out and angry men would stand up and try and shout down the man speaking at the front. The rows neat rows of chairs that would have been put out in the morning but with the all the anger and shouting they would have been higgledy piggledy. I would love get some tapes of parliament from that time so you could hear them – the shouting and the anger. As a young child during the winter, when it was already dark, I found it quite frighting. The shouting was hateful, loud and constant – well the stuff they broadcast anyway. In the morning we also had Radio 4 on and the time I needed to leave to for school was when the “Yesterday In Parliament” segment started with an “Order Order” from the Speaker. When I eventually did get to see the inside of Parliament with it’s green seats I was very surprised as it looked nothing like the image in my mind. For a start there were benches, not tubular steel chairs covered with cloth and the benches were set out in rows facing each other. When I listen to you William talk about how you image things work I think about my ideas of parliament and how wrong I was but it was fun to imagine. after yesterdays turn of events the Tory press and politicians went into a tizzy as it looked like a deal was about to happen between the Lib Dems and Labour. By the time you are able to read and understand this blog Rupert Murdoch, if there is any justice in the world, will be long dead, but no doubt his influence will still be felt. And yesterday his mouth piece, Sky News, was touting that a deal between the Conservatives – who he supports – had done a deal with the Lib Dems and his favourite – Cameron – was going to become the next Prime Minister. Just a few minutes later Gordon Brown announced that he was going and that Labour and the Lib Dems were in negotiations. The Murdoch press simply spat out their dummies and got annoyed. Other Tories came out and said some quite bizarre things. Malcolm Rifkind then came out and said that the Lib Dems were some how traitors because they were concentrating on electoral form and not the economy and that working together on the economy was in the best interests of the country. So it is the view of Malcolm Rifkind that economics is more important that extending democracy, in fact we should ignore democracy because economics is more important. There is a word for ignoring democracy and focusing instead on “economics” for “the benefit of the nation”: fascism. It would be much better for the economic good of the country to force people to work for long hours for poverty pay. That way the UK could compete with China. In fact slave labour would allow the UK to become the manufacturing giant of the world. Unlike Malcolm Rifkind I believe that people are more important than market economies and that extending democracy is better than finance. The latest news coming out is that Labour have thrown in the towel and that David Cameron will become the next Prime Minister but the question remains – as part of a coalition or as a minority. It will be interesting, if there is a coalition, to see how hard the Lib Dems will work to keep the Tories honest.